All over Australia there are sites where you can find wonderful examples of aboriginal rock art and prehistoric cave paintings in a range of styles. One particularly interesting style is the cross-hatch or "X-ray" art found in the Arnhem Land and Kakadu region of the Northern Territory. 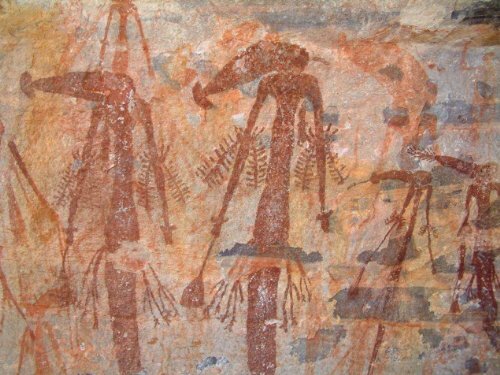 These paintings from long ago, some as much as 40,000 years old, are representations not only of the indigenous creatures of the region, such as fish, turtles, and kangaroos but also of mythological creatures, the Mimi spirits, who are believed to be creation ancestors who taught the people all that they needed to know. Another form of rock art is the "Bradshaws" in the Kimberley region of Western Australia. Again, many of these date back thousands of years. Known as "gwion gwion" by the natives, legend has it that birds created them using their own blood and feathers to draw the figures. There are many aboriginal communities living in their ancestral homelands within Kakadu National Park located in the Northern Territory of Australia. In addition to its natural beauty the park is filled with thousands of cave paintings produced by the Aboriginal people over tens of thousands of years. These rock faces have been continuously painted and repainted for tens of thousands of years, the original paintings dating back as much as 40,000 years, and many have continued to be repainted up to contemporary times. In sites such as Ubirr and Nourlangie there are rocky outcrops that have afforded shelter to Aboriginal inhabitants for thousands of years. In these "caves" there are found many paintings on the rocks, revealing the spiritual culture of these people. In fact, their belief is that many of the art works were painted by spiritual beings, Mimi spirits who were involved in the creation of the world and who brought understanding of life to the people. The paintings contain the spiritual power of these beings and it is the responsibility of the people to maintain them, repairing damage and repainting them to preserve not only their beauty but also their power. Nourlangie is located in an outlying formation of the Arnhem Land Escarpment. Numerous shelters in this large outcrop contain impressive paintings of various creatures indigenous to the region. A number of the paintings represent creation ancestors. These drawings are usually in red ochre and show elegant, graceful stick-like figures in action - fighting, running, dancing, leaping and hunting. Many paintings of what are called "Mimi spirits" are located high up on the rock and it is unclear how human beings could have reached the area to paint them. 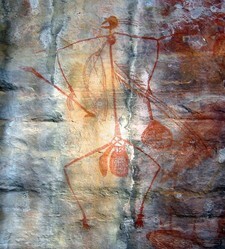 The Aboriginal people claim that their Mimi rock pictures were painted by the Mimi spirits themselves. The Mimi are very thin and fragile and are said to live in the nooks and crannies of the rocky landscape. They are seen not only as the artists of their self-portraits, but also as the Dreaming ancestors who taught people to paint, hunt, dance and compose songs. The stories connected to these artworks are known only to certain Aboriginal people. Ubirr is located in the East Alligator region of Kakadu National Park. It consists of a group of rocky outcrops on the edge floodplain where there are several natural shelters contain Aboriginal rock paintings, some of which are many thousands of years old. There are three galleries of art accessible to visitors. At the Northern end of the main gallery can be seen a painting of a Thylacine, or Tasmanian tiger, which has been extinct in the area for about 20000 years, and attests to the antiquity of the paintings. Many of the paintings at Ubirr are in the "X-ray" style in which the skeletons of the animals and humans portrayed are drawn inside the outline, like an x-ray. The paintings depicts certain creation ancestors, Mimi spirits, as well as creatures such as fish, turtles and wallabies that are all indigenous to the area. The Bradshaw Paintings were discovered by Joseph Bradshaw in 1891, while lost on an expedition in the Kimberley, Western Australia. They are known as Gwion Gwion by the local Aboriginal people. Legend has it that these paintings were made by birds. The story goes that birds pecked at the rocks until their beaks bled. They then used their tail feathers and their own blood to create the paintings. The paintings now are actually just red coloring in the rock, with no pigments remaining on the surface. As a result, the normal methods of testing the age of the paintings by carbon dating technology are useless. Some of the paintings originate from a past long ago. How long ago has been debated, with some claiming as much as 50,000 years. In 1996 one of the paintings was dated by using thermoluminescence on an ancient fossilized wasp nest that had covered it. The nest was found to be over 17,000 years old, dating some of the paintings to at least that era. Regardless of the actual age of the paintings and how they were created, what is undeniable is that these are incredibly beautiful and sophisticated works of art. Information on the Bradshaw Foundation website. Kakadu National Park website pages on aboriginal rock art. Are you Amazed by this Rock Art? Whether drawn by Mimi spirits (I like that idea) or blood of birds, aboriginal rock art provided an interesting read for me with my morning coffee. Thank you. Yes I am ! I love art that comes from nature and this is just stunning . Thank yo so much for posting this. I have seen Perth Mint coins showing modern aboriginal art, and these have a similarity, There is some difference in that modern pieces use short lines arranged to outline a piece when done one after the other, or a series of dots as it were. Yet, there is a similarity. Isn't the Kadadu region tropical? Yet they have survived. Amazing to have them so well preserved in a damp environment. Something unique for your room - Metal wall art by amazing contemporary artist Ash Carl!